First off, I’d like to say sorry to Sherry for taking so long with this review. Soule has crafted a thrilling story with plenty of romance that will keep readers wanting more. 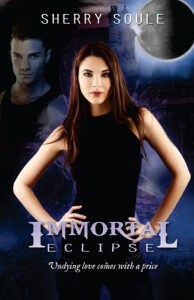 I loved the atmosphere that Soule created in Immortal Eclipse. Summerwind is a spooky place, and she does a wonderful job of keeping readers guessing. There are a lot of twists and turns as the story goes along, but I think my favorite part of Immortal Eclipse was seeing Skylar grow as a character. In the beginning, when her life in New York begins to fall apart, Skylar isn’t entirely sure what she wants to do, and even when she arrives at Summerwind, she isn’t entirely sure why she’s there. But as the story goes along, Skylar ends up finding what she didn’t know she was looking for. Thank you, Sherry and Disenchanted Publishing, for sending me a review copy.